Following on from yesterday's post, I've decided to round up several gift ideas for men, that are £10.00 and under. I am aware the men's category collage a litttleeee bit more jumbled than the likes of the pretty, girly pink, gold and white collage I had made yesterday for the women's gift guide, but I have thrown in a few more comical options for the men. For the stationery lovers out there, Tom Dixon's range is definitely one to keep an eye out for. All of the items have a very luxurious feel to them and the notepads/sketchbooks particularly would make for a classy office accessory on a budget. Lots of the items are detailed in gold and rose gold which look eye-catching on display and serve a purpose too. For the homebody, John Lewis have a pretty big selection of candles and their Frosted Spruce scent would be perfect for this time of year. The packaging is more masculine than some of their other candle designs and would make a lovely gift to keep the recipient's place smelling Christmassy throughout the season. For a cosy night in, to gift with the candle, Holdsworth's Peanut Butter Caramel truffles would be a welcome guilty pleasure too I'm sure. 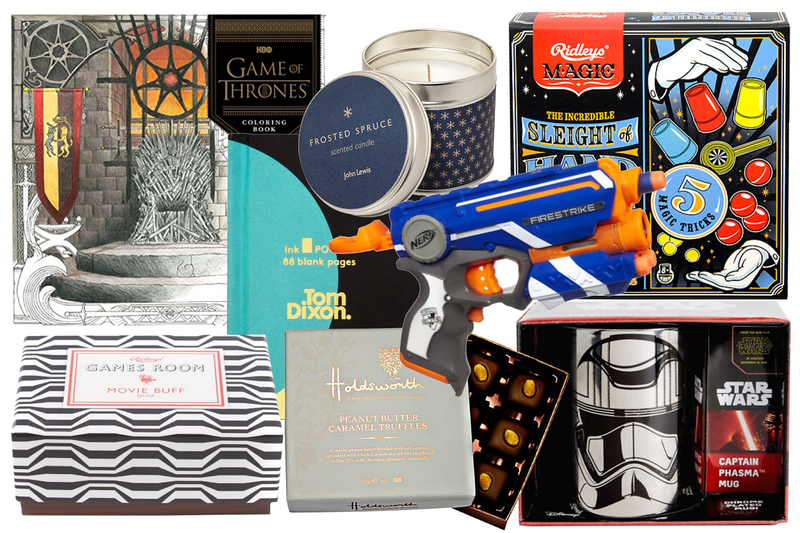 And last but not least, it wouldn't really be a men's gift guide without throwing in a Nerf gun, would it? I may have found this on Toys 'R' Us but I think a lot of men, regardless of age, would quite happily receive one of these bad boys for Christmas. Am I right?